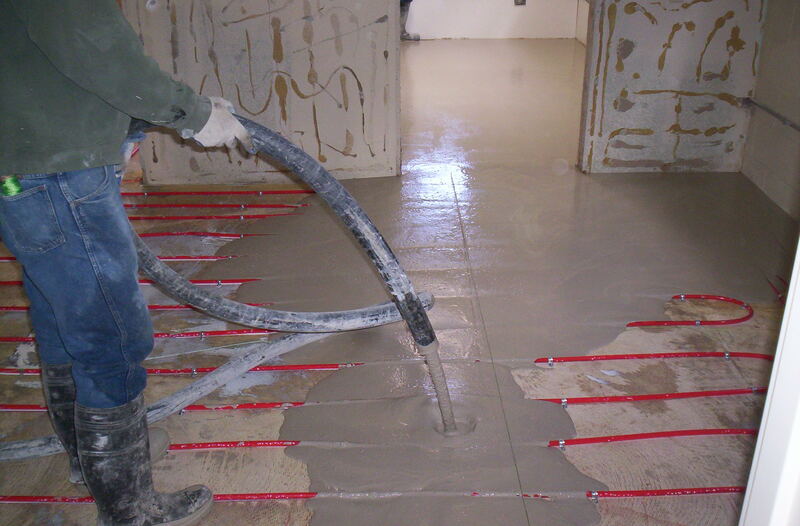 Radiant Heating and cooling for new homes and remodels. Radiant heating and cooling is quiet, super-efficient, healthy, and saves money. Imagine stepping out of the shower to a warm tile floor beneath your feet. Experience radiant heating, the ultimate comfort in heating while increasing the health of your living environment. Instead of noisy fans pumping heated air through your home, your radiant heating system heats the floor itself, which then radiates heat up into the room. Radiant heating and cooling is simple, quiet, and super-efficient, saving homeowners significant money on their heating and cooling bills. This is because the energy goes directly to where it is most needed. 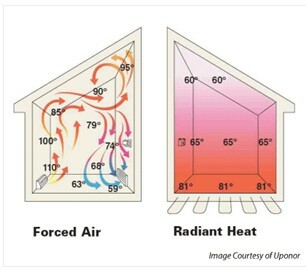 Unlike forced-air, which typically traps hot air at the ceiling, radiant heat from the floor is directly absorbed by your body and your home's walls. Because your skin absorbs radiant heat, it's uniquely comfortable - like the feeling of sun through a window or a fireplace on a winter's day. Request a FREE Consultation today! A radiant heating and/or cooling system is virtually maintenance-free. The tubing we use offers toughness, flexibility and lasting durability. It is corrosion resistant and withstands temperatures from below freezing to above the boiling point. There are also no vents and ductwork to collect dust and clean. Request a FREE Consultation today! We service all of the following areas: Southern Monterey County, King City, San Miguel, Paso Robles, Cambria, Cayucos, Los Osos, Atascadero, Templeton, Santa Margarita, San Luis Obispo, Moro Bay, Oceano, Grover Beach, Arroyo Grande, Pismo Beach, Nipomo, Guadalupe, Santa Maria, Orcutt, Vandenberg, Lompoc, Los Alamos, Buellton, Santa Ynez Valley, Solvang Los Olivos and everything in between. Request a FREE Consultation today!